Ships 10-15 business days after artwork approval. Price includes one stone color and one imprint color. Additional charges apply for additional colors. Custom mixed PMS colors also available. Good news! Our tooling and casting charge has already been added to the product price. No extra setup charges for a standard product design! Product dimensions: 3 3/4" x 1" x 5 5/8"
We can engrave recipients' names into each piece. Contact us for a quote. Comes individually packaged in a white foldover box. We will contact you to get artwork, stone, and color selections for your order. Example shown includes optional extra imprint color. When your team solves a major dilemma, they deserve a memorable award. This unique award is made of stone cast from recycled materials, so it's eco-conscious. 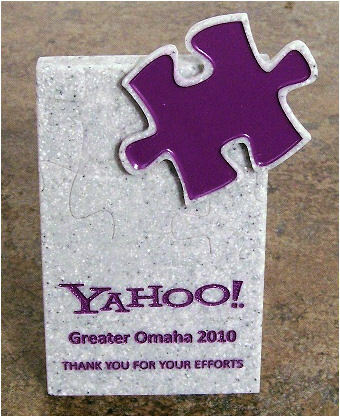 You pick the color of the stone, the puzzle piece, and the imprint to truly customize the award. We engrave your logo or special message on the base. We can also add names, dates, contest categories, etc. for an additional charge. Customize your award by selecting from 19 colors in 4 stone patterns. The standard colors for our recycled stone awards are: Black, Grey, Ash, White, Cream, Tan, Taupe, Chocolate Brown, Garnet, Orange Clay, Red, Burgundy, Plum, Dark Green, Medium Green, Sea Green, Dark Blue, Medium Blue, and Marine Blue. The four stone patterns are solid, marble swirl, dark speckle, and light speckle. We can also die the stone to match your custom Pantone color (additional charge). We'll help you select stone and inscription colors after you place your order. Or call us and we'll send you a pre-order proof so you can see some color options. Pantone color matching also available for stone colors and color fills (additional charges apply). Occasions: Corporate kick-off meetings and team building sessions. Suggested slogans: "Piecing It Together" "Best Fit"